Fire At Romanian Nightclub Kills 27 People During Music Show : The Two-Way A crowded club in Bucharest became the scene of tragedy Friday night, after a fire broke out, spreading flames and smoke and causing a panic among the young patrons. 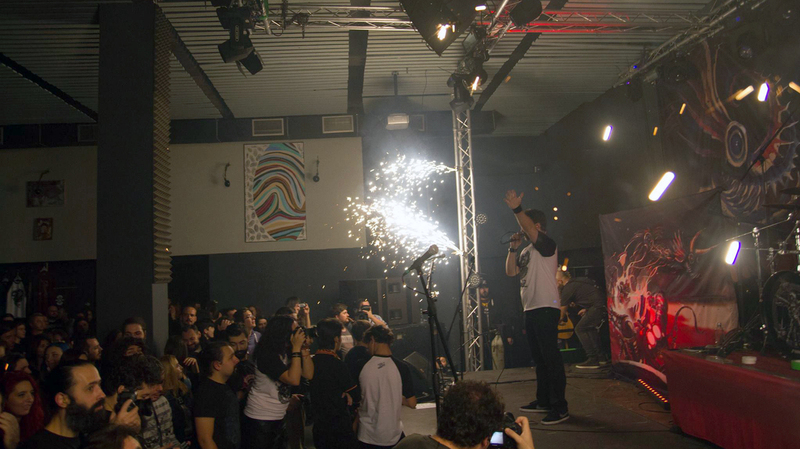 A member of the Romanian metal band Goodbye to Gravity performs as fireworks erupt on stage before a fire broke out at the Colectiv nightclub in Bucharest, Romania, Friday night. A crowded club in Bucharest became the scene of tragedy Friday night, after a fire broke out, spreading flames and smoke and causing a panic among the young patrons. Romania's government has announced three days of mourning for the 27 people who died. The blaze reportedly spread from the stage and eventually across the ceiling of the Colectiv nightclub. The fire and the ensuing melee sent more than 180 people to hospitals, according to the Agerpres national news agency. "Fireworks set off inside during a heavy metal rock concert are suspected of having caused the blaze that tore through the club. "Many of the deaths and injuries occurred during the stampede for the exit. A witness told Romania's state news agency the terrified crowd broke down a second door down to escape. "Hospital officials say many of those being treated were suffering from smoke inhalation and severe burns." Citing a witness who was at the club, Reuters reports, "A pillar covered with foam panels and the club's ceiling went up in flames and then there was an explosion and heavy smoke." According to information on the Colectiv club's Facebook page, last night's show featured the metal band Goodbye to Gravity, which was launching a new album by playing a free show. An official inquiry into the fire's cause is under way, and Agerpres reports that prosecutors in Bucharest are also investigating, citing sources that refer to possible criminal charges of manslaughter and willful destruction.